Don't Spy On Me NYPD! / CISPA is Back! As even small police departments are being increasingly militarized, our most basic civil rights are being threatened by laws such as the NDAA. Details about massive surveillance programs on innocent Americans are being uncovered almost every month; Everyone is already under virtual surveillance! 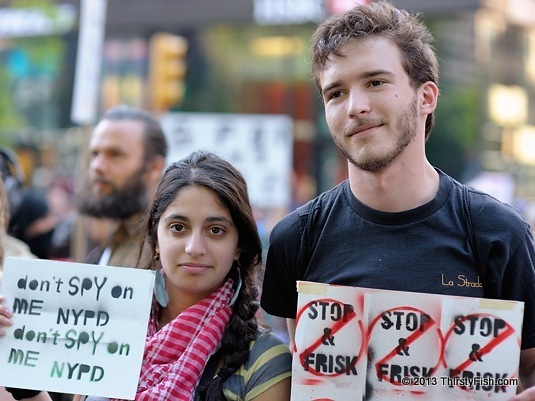 The NYPD, heavily criticized for its controversial Stop-And-Frisk policies in the past, was caught spying on Muslims, in places that they eat, shop and pray. It was discovered that the NYPD even operated outside of their jurisdiction, in New Jersey, which angered Governor Chris Christie. I am not a person that entertains conspiracy theories, but the combination of mass surveillance, militarization of police forces, and ambiguios laws, begs one question: What are they afraid of? As Chris Hedges assessed, could it be a "preparation for the impending blowback from an economic decline and climate disaster". After all, there is little doubt that the fourth branch of government, banks, lobbyists, and corporations, indeed have become the dominant "branch" of government. If you think all of this does not concern you, then, take ten minutes to hear the story of Brandon Raub. Photographed at Occupy May Day last year. Update: CISPA is back! The Cyber Intelligence Sharing and Protection Act (CISPA), which was defeated last year, is being reintroduced in its previous form this week. Supported by the likes of Facebook, AT&T, Microsoft, Verizon, Telecommunications Alliance (ITTA) and the US Chamber of Commerce, the bill gives companies unprecedented power to share your "private" information with each other, the government, and private security agencies. The bill raises serious privacy issues, and violates the 4th Amendment. What's more, it is being reported that the White House is threatening to issue an executive order, should the bill not pass the congress. If the bill passes or an "illegal" executive order is issued, you can kiss any privacy on the Internet, goodbye! Mass censorship, targeting of whistleblowers and journalists, and unaccountable surveillance will follow. A perfect Orwellian plutocracy.